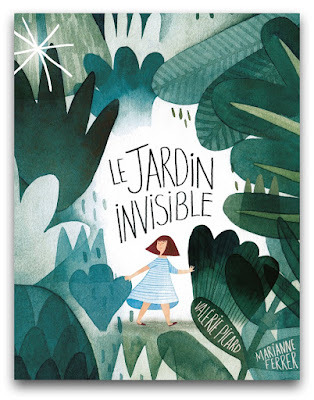 When her family travels far from the city to the country to attend her grandmother's birthday celebration, Arianne enters a marvelous world of lush vegetation, magnificent creatures and an adventure of epic proportions, like all in Le Jardin Invisible (translation: The Invisible Garden). As pleased as she is to see her grand-maman, Arianne is the lone child in a house full of guests. A parent suggests she go play in the garden. A city child, unaccustomed to making play in the outdoors, Arianne is bored and lays down in the grass. A small pebble (caillou) brings her to see another world in which the pebble is a mountain, locusts are as big as cars, and plants like trees. She chases after the locusts but loses them and catches a ride on a dandelion seed to continue her quest. Skipping her pebble into the water, she drops in too, witnessing the wonders of the sea including the evolution of aquatic creatures to land dinosaurs who assist her in capturing a star that she releases into the cosmos. Perhaps Le Jardin Invisible is but the imaginative dream of a child bored with adult activity who takes bits and pieces from her surroundings and builds them into a story. Ah, but what a story! She sees mountains, and travels on fluffy seeds, races with creatures small and large and reaches into the heavens for a touch of magic. 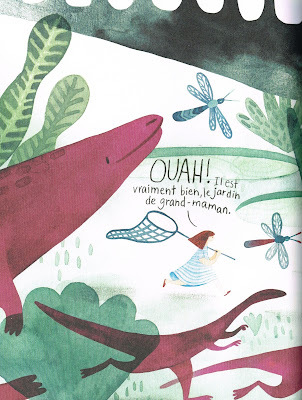 No wonder when the family is returning to the city late at night, Arianne declares to the sky of stars and ethereal shapes, "À beintôt, les dinosaures!" (translation: See you soon, dinosaurs). Surprisingly, in 64 pages, there are few words. The text is essentially a series of questions and exclamations. But Valérie Picard's sparse text blossoms into a full story with Marianne Ferrer's illustrations. Marianne Ferrer's art, first reviewed here from her picture book Racines (Monsieur Ed, 2016), gives an ethereal context to Arianne's journey from city to country to Le Jardin Invisible. When the insignificant child is delegated to the garden, she becomes part of something larger, much larger than herself but still part of it. Marianne Ferrer's locusts are majestic in every facet, her plant life varied and sumptuous in tones of blue, green and rose and her underwater scenes are resplendent in shades and hues of blues. Like Arianne, these worlds are largely ignored until looked at with a closer lens. 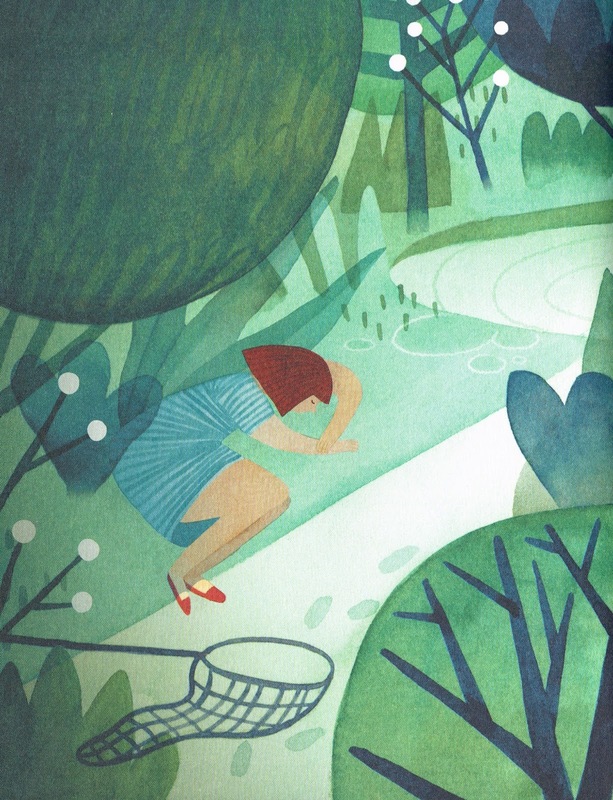 Whether Arianne visited this lavish garden by way of her dreams or simply her imagination is irrelevant. Le Jardin Invisible is one to be seen and appreciated from any perspective. n.b. 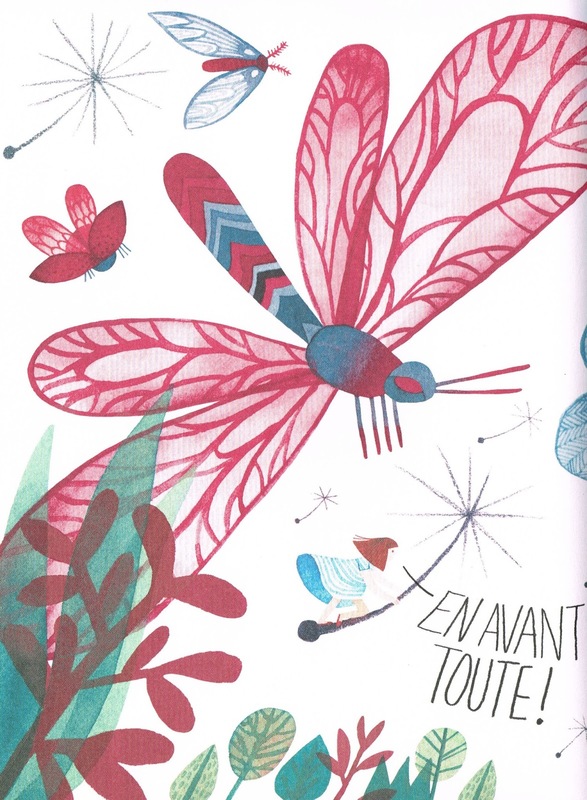 The interpretation of this French-language book is solely my own. I take full responsibility for any errors in translation and interpretation of words and art, and apologize for any discrepancies from the author/illustrator’s intent.